A QR Code is a matrix code (or two-dimensional bar code) created by Japanese corporation Denso-Wave in 1994. The “QR” is derived from “Quick Response”, as the creator intended the code to allow its contents to be decoded at high speed. QR Codes are common in Japan where they are currently the most popular type of two dimensional code. I stumbled upon a cool website that will generate a QR code for you. 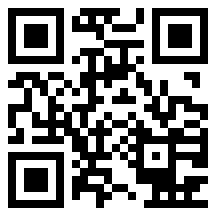 If your phone was able to read QR codes, the image in this post would take you to my site. Head over to Kaywa to generate your own QR code. Via MoMB.